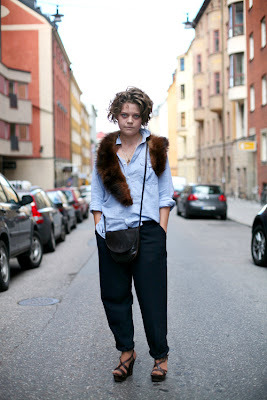 Comments on "On The Street......Fur Collar, Stockholm"
That fur collar is so beautiful. I like the colors of her look. The cold weather is soon coming and then it is time for furs.Maybe she is trying to attract attention-who knows? what a mess and how beautiful! i like the way the fur hangs, that masculine approach, her messy hair. lovely indeed. I'm not sure what I feel about this photo, but I must say her eyes are hauntingly beautiful! The fur collar looks more alive than she does. I like the shoes (a lot), but the rest of this does nothing for me. She looks very sloppy and disheveled. I love this. It's so simple and depends so much on how the clothes are arranged. And the androgeny of the look--it's got that faint touch of womanly glamour but also a richness that is masculine, and of course the shirt and pants are rather neutral. Actually, this outfit would look awfully good, in a faintly-transgressive way, on the right guy (probably different shoes, though). And her scowl! Speaking as someone of ridiculously Swedish descent, I enjoy seeing all these very obviously Swedish people--I grew up in a heavily Italian area and always felt a little freakish. The man with glasses in the plaid shirt, for example, looks tremendously like my grandfather--also a wearer of plaid shirts and very good-looking his whole life. I find this photo alarming. Wearing fur for warmth/necessity is one thing (think Mukluks or living in Siberia). But this is rather flagrant. Also her make-up is a bit corpse-y. I find this to be the opposite of fashion or trendy or appealing. she definitely has her own style, but she's looking a bit "chucky doll" to me. The ghostly eyes and the randomness of the fur stole if seen in person would make me think she may just be a little crazy, not at all fashion forward. But in the context of this site, well, that always changes things. Still, not my fave by a long shot. very Peter Lindbergh looking girl - even though i'm not overly keen on fur, it's a great combo with the rest of the outfit. She definitely brings the phrase "beautiful mess" to mind. I don't think she looks sloppy and disheveled at all. She looks totally cool, artfully arranged. I like her. She looks as if she has a mind of her own. love the effect, love the look, love the shoes. the fur, irl is creepy, but the style, the idea, is great. wow, what an amazing look. The photo is great. Really great. i love her eyes! like someone else said, so hauntingly beautiful. This is horror film chic! A daintier shoe - but not too much so - would have been even more perfect. Zombie chic? Perhaps. Self-expression. Definitly. Her look is half-Goodwill bag, half-middle finger to the world. This young lady has something to say, but it's being overpowered by her aggressive attitude and teenager angst. I love it. This is style, as opposed to fashion. That said, I'd love it more with pants that weren't pegged at the ankles. Intriguing combo. All these simple elements topped with the fox fur. And those eyes. And that hair. Winter in the summer. Dark in the light. I love this. I think it's stunning. So unfussed and yet oddly composed. A little like a painting. Or a mood. i can't say i care for her look.. even aside from the ghoulish complexion. she is sooo Edward Goreyly fantastic! Her expression certainly won't win many friends, but she is exhibiting individualism. The one thing I can't get over is her nylons. They don't match her skin, and they don't look good with the shoes. What a murderous look. I love it. Especially with the open shoes & tights. she looks like she would wear that! The chic fur & heels contradict vastly with the messy hair, heroin chic make-up and messy blouse. I can't decide if this is an accident or she's just brilliant. You let people talk about her "ghoulish complexion" ? That's just mean - on your part as much as theirs. You wouldn't have dared post so many negative comments if this woman was an editor or associated with French Vogue. Really troubled by your obvious and constant favoritism. I think she is prepared for the reactions she probably gets and I have even more respect for willingness to do so. No me gusta nada, sobre todo los ojos, parece que este bebida, en general no me va.